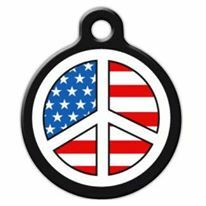 Dog Tag Art (dogtagart.com), makers of high quality pet ID tags, is helping to raise awareness for the 31st anniversary of Peace Day on September 21st, by donating 30% of sales to Veterans for Peace, Peace One Day, and Playing for Change, and asking supporters to Tweet #PeaceDay. Dog Tag Art promotes #PeaceDay for 9/21. Dog Tag Art (dogtagart.com), makers of high quality pet ID tags, is taking a stand for peace. The Asheville, North Carolina-based company wants to help raise awareness for the 31st anniversary of Peace Day on September 21st, and is asking supporters to Tweet #PeaceDay throughout the day on September 21st. To show their support of Peace Day, between now and September 21st Dog Tag Art is offering a "peaceday" promo code with no-cost shipping for customers and donating 30% of their sales to Veterans for Peace, Peace One Day, and Playing For Change. Dog Tag Art is also co-sponsoring a pro-peace rally to begin at 11:30 AM EST, online via PeaceOn.Us, with special in-person events taking place at Asheville Art Museum, Black Mountain College Museum + Arts Center, and Firestorm Cafe. "Asheville is the only city in the world to have had major Peace Day celebrations for the past three years. However, outside of Asheville, virtually nobody in the United States knows that 9/21 is Peace Day," said Ben Mack, Asheville public artist working with Dog Tag Art on raising awareness for Peace Day. For the past thirty-one years, the 193 member nations of the U.N. have dedicated September 21st of each year to world peace, and specifically the absence of war and violence. However, the U.N. has yet to actualize a temporary global ceasefire in honor of their declaration of an International Day of Peace. "Peace Day is a wonderful idea, but without awareness that 9/21 equals Peace Day, we'll never actually get our government to honor peace day. 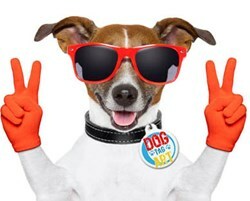 That's where DogTagArt.com can help because of our online reach. By inviting customers, vendors, and friends to work together, we can make Peace Day a trending topic, which will raise awareness and invite more people to celebrate Peace Day," said Jack Carrier, Dog Tag Art owner and founder. "Making #PeaceDay a trending topic on 9/21 is all about collaboration. If we make this happen, it's like saying the Twitter users of the world have voted for peace on 9/21," said Warren Whitlock, a Top 10 Forbes Social Media Influencer who Tweets via @WarrenWhitlock. PeaceOn.Us will stream the live events from Asheville Art Museum, Black Mountain College Museum, and Firestorm Cafe, produced by the non-profit Billions Rising. Dog Tag Art makes high-quality personalized pet ID tags featuring a sturdy recycled steel core and permanent graphics. The company was founded by owner Jack Carrier, to ensure the safe return of his beloved wandering Chocolate Lab, Maggie. Dog Tag Art has been featured on Regis and Kelly, as well as in The New York Post, Dog Fancy, and in several other publications.